For decades, Bob Schwiderski has been a voice for victims of clerical abuse. He's blanketed the neighborhoods of accused priests with fliers and held press conferences to encourage others to speak out. This week, Schwiderski kicked up his crusade. He released an updated version of a map he created showing where each of the allegations of sexual misconduct that he's recorded over the years occurred and by whom. There's 250 names total, and they include not only Catholic priests and monks, but Episcopal and Protestant pastors and their staff. You'll also find four nuns. The map is entitled "The Hunting Grounds" because Swiderski believes that places of worship, no matter the denomination, attract sexual predators. "Some people know that if they present themselves in this godly way they'll have access to children," he tells us. "And the families are trusting of the people who work in the churches." He would have included allegations against leaders of other religions, but he doesn't know of any. And even if he did, he'd need a second source. Every person on the map has at least two allegations against them, he says. Another list he keeps private includes 261 Christians. His careful approach of naming people publicly, which he honed as the head of the Minnesota chapter of SNAP, has the benefit of bringing victims together. Schwiderski asks everyone who comes forward with an allegation to contact their old friends and classmates, looking for similar stories of abuse. "All of a sudden, there's two or three people and they haven't talked in 20 years," he says, "but now they have people to walk forward with." Many of the names on Schwiderski's list have shown up on other ones compiled by Jeff Anderson, whose law firm represents victims, and by the dioceses of Minnesota, which were compelled to name "credibly accused" priests last year. That is, except for the Diocese of New Ulm. Clerics and attorneys there have argued that two living priests deny the allegations and therefore don't want their identity made public. 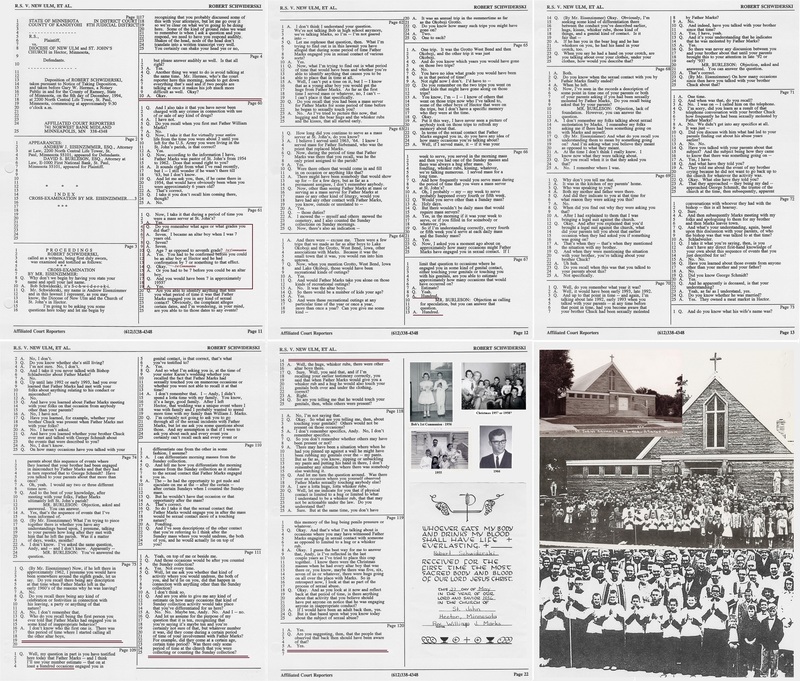 Schwiderski's own list shows dozens of Catholic priests with connections to New Ulm, including William Marks. Schwiderski says Marks abused him a hundred times as an altar boy in Hector, and when caught, disappeared into another parish. "The Hunting Grounds" touches 345 cities in all but two of the state's counties. Not everyone on the list is accused of abusing minors. Some are accused of having sexual relations with consenting yet vulnerable adults. Check out the map on the next page. For names, check out Schwiderski's blog.